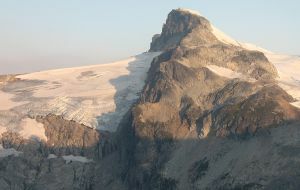 Located in the Pitt River drainage on the south side of the Staver Glacier and at the head of Shale Creek. The nearest access is via logging roads in the Pitt River drainage. Use a road that climbs up the north of Shale Creek to reach the southwest ridge of Skakala Peak. Follow this ridge over Skakala Peak and then ascend contour along the south slope of Katzie Mountain to reach the northwest ridge of Stalo Peak. Follow this ridge to the summit.